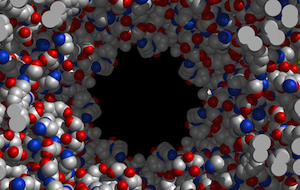 The conic command produces a space-filling rendering of the displayed molecule(s). The current orientation and coloring are retained. Atoms are depicted as spheres with realistic highlighting and shadowing effects (the VDW radii are used). This image is not interactive and can take anywhere from a few seconds to a few minutes to produce. Clicking the left button returns to interactive graphics. The conic command is actually an alias that uses pdbrun to send data to the outside program conic. There are many options, which are detailed in the conic manual page. *On Mac systems, the conic -o flag or configuration file output option must be used to generate any output at all. If display is desired in addition to an output file, the -s flag should also be used.